Plans for a new digital arts school in Manchester backed by film director Danny Boyle have been approved. 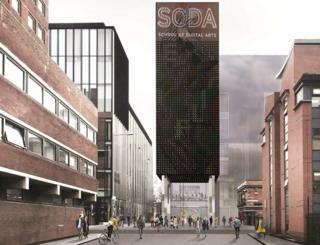 The new £30m institution, known as SODA, which will include studios, digital laboratories and productions suites, was rubber-stamped by city council planning officers earlier. It is due to be built behind Manchester Metropolitan University's student union by 2021 amid campus regeneration. The school will run courses in film, animation, special effects and design. Trainspotting director Boyle and producer Nicola Shindler, founder of Red Productions, are backing the venture, which would provide courses for about 1,500 students every year. Designs for the five-storey building show a cafe, "digital gallery" and screening area that would be open to the public. They also show teaching areas and "digital innovation labs", with a film studio and further teaching space on the top floors. Funded jointly by the university and Greater Manchester Combined Authority, the school is expected to work closely with the BBC, ITV, cultural centre Home and Red Productions. Planning documents stated: "There is a recognised skills gap in specialist digital roles in the technology industry in the region and this needs to be addressed if Greater Manchester is to become a world-leading digital city region." The wider campus regeneration is set to take the best part of a decade to complete.